Are you planning a vacation to New Zealand? 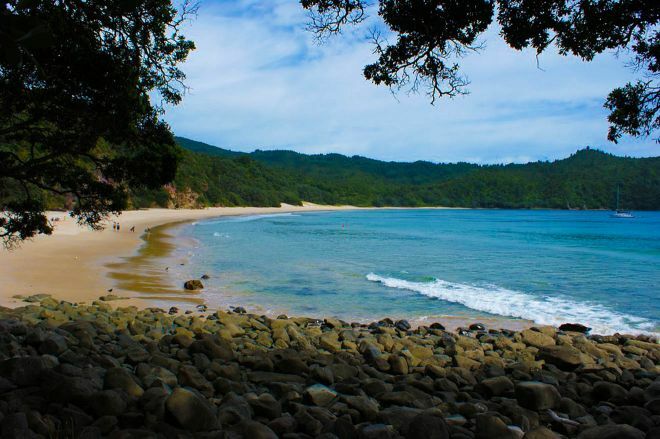 Here is why you should add a unique place to your list – The Coromandel Peninsula! This is an incredible place that has it all – beautiful pristine beaches, rainforests, historical buildings, hot springs and many other amazing attractions! There’s something for everyone there, regardless if you’re an adventurous hiker, surfer or more of a slow traveler, who enjoys long walks and relaxing in a luxurious spa. Calm beaches and gorgeous rainforests altogether – isn’t that the perfect combination? Coromandel Peninsula is situated only 2 hours away from Auckland. The entire peninsula is almost 85 kilometers long, situated on the North Island of New Zealand. Here you can check out my suggested itineraries for North Island and South Island or the perfect road trip around New Zealand in 3 weeks. Overall, I think Coromandel is a very underrated place where you will see mostly locals – at least that’s what I saw when I was there. I only stayed there for one night and it definitely wasn’t enough. There are so many cool activities to do there that you have to stay for at least 2-3 days in order to enjoy it as you should. 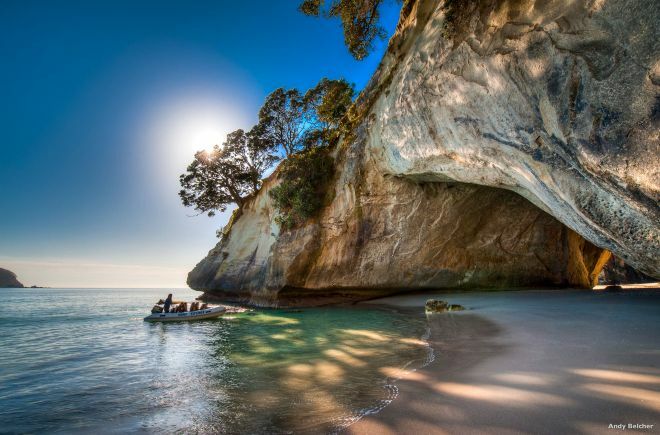 Even though there are lots of beaches in Coromandel, this one is definitely a must see while you’re there! 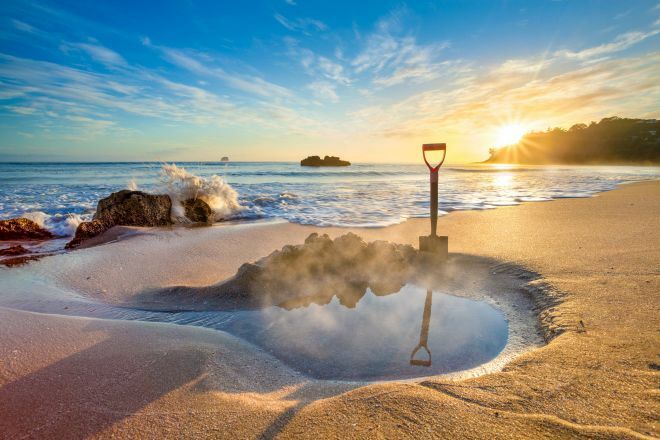 The Hot Water Beach in Coromandel is actually considered a worldwide wonder because of the thermal water beneath the surface of the sand. Do you know what this means? It means you can dig your own small pool that will fill with hot water and you can lay in it to relax! I actually recommend Hot Water Beach in Coromandel as one of the Top 10 things to do in New Zealand! This world famous beach situated on Mercury bay on the East coast contains two volcanic hot water springs that keep the water heated at up to 64 degrees Celsius. The beach is very different in low tide than in high tide. At high tide it looks like a normal beach, but at low tide you can do this unique activity. A little work that will offer you so much satisfaction and fun! You can even rent the spades on the beach! WHEN TO GO: Best time to visit is 2 hours each side of low tide. 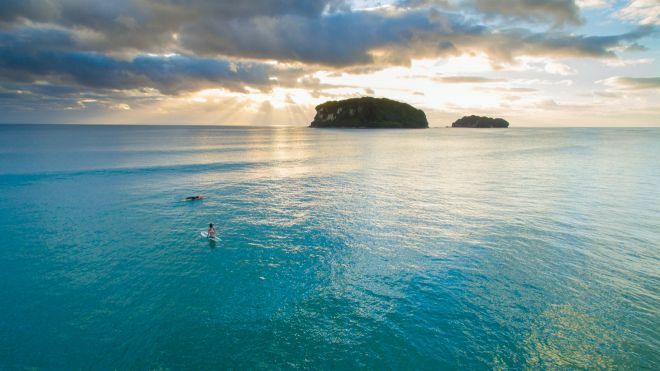 You can find all the information you need about the Hot Water Beach tide times and weather conditions for each month by checking The Coromandel website. Make sure to check for this information beforehand – it’s very important because at high tide the waterline covers the geo-thermal openings so you won’t be able to do this activity at all! 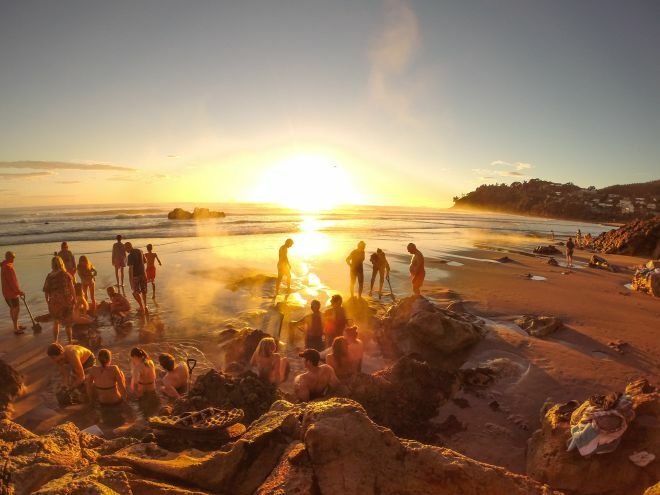 HOW TO GET THERE: Hot Water Beach is situated on Mercury Bay, on the east coast of the Coromandel Peninsula. It’s 12 kilometers south-east of Whitianga, and around 175 kilometers from Auckland by car. TIP: If you go there at night on low tide, you can even see glowworms on the way leading up to the beach! Now if this isn’t one of the best beaches in Coromandel, I don’t know which is! IMPORTANT: The Hot Water Beach can be unsafe at times due to strong currents. Make sure you are always supervised and you swim between the flags! Also, always keep an eye on the incoming tide while you’re in your home-made pool! 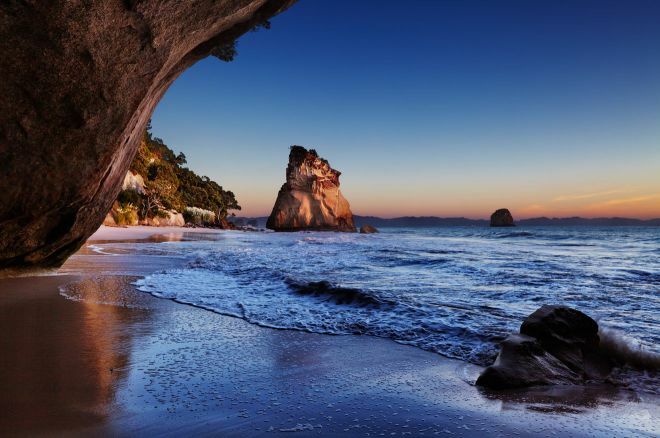 Cathedral Cove is one of the top places to visit in Coromandel if you want to witness the real beauty of this place! It’s basically a rock surrounded by golden sand and the sea. But trust me, the entire Cathedral Cove beach looks like paradise! This wonderful attraction is located in the north-eastern part of the Peninsula and it’s actually an 840 hectares marine reserve maintained by the Department of Conservation. The famous Cathedral Cove was also the place where a well-known scene from The Chronicles of Narnia movie was filmed! This famous attraction can only be seen by walking or by taking some Cathedral Cove tours such as taking an open boat or kayaking. I strongly suggest you try the kayak , even though walking is completely free. Exploring the place by kayak offers a unique sight that I’m sure you won’t forget very soon! If you prefer walking, I suggest you start your journey at Hahei Beach. This is a very nice spot that you can enjoy before starting your walk. Just keep in mind that Hahei Beach is the last place where you can buy something to eat or drink (and I suggest you have some supplies with you) before you start discovering the Cathedral Cove in Coromandel. Don’t worry, you will have plenty of photo opportunities and places to rest along the way if you get tired! I also suggest you take a 2-kilometers (half hour) detour named “Viewing Platform”. This will offer you a different perspective on this amazing place and it’s one of the more off the beaten path places where you will find almost no one. You will basically feel like you have the entire place to yourself! This will take 45 minutes one-way and 90 minutes roundup, but it can easily take you the entire day if you wish! If you are more adventurous, another suggestion would be to take a tour named Sea Cave Adventures. This will take you on an open boat and you will go inside the Orua Sea Cave (and experiment its acoustics) and you will even be able to snorkle at Gemstone Bay! As I previously said, seeing Cathedral Cove by kayak would be a unique experience. 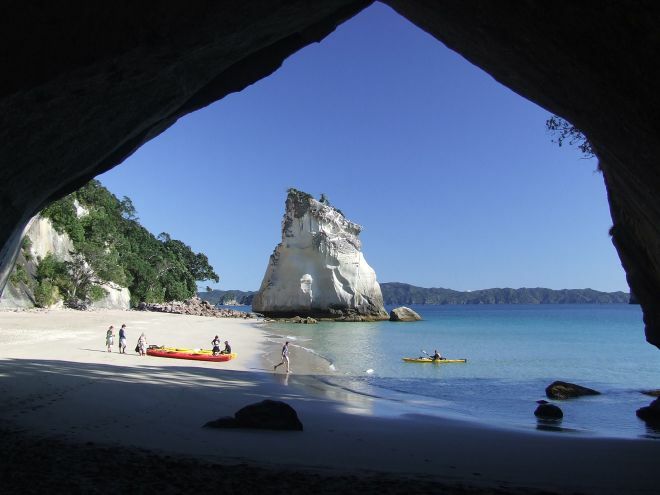 Kayak tours are available daily at Cathedral Cove and you will get to see its coastline in an amazing way! There are other activities you can do at Cathedral Cove, including sailing, going around with a glass bottom boat, dive, snorkel and more! You can find more details about all the available tours on The Coromandel website. 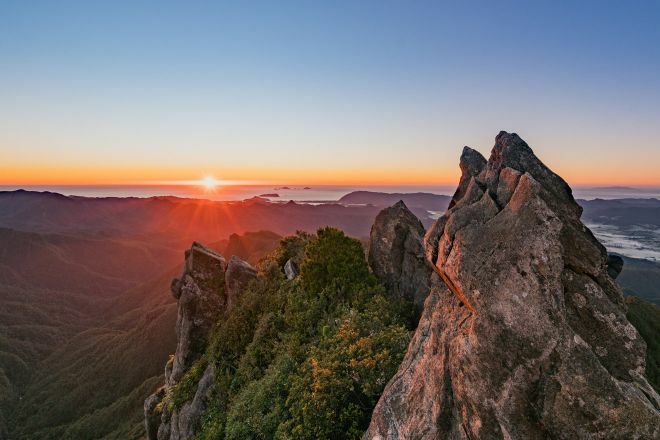 If you’re an adventurous individual who likes to hike, then The Pinnacles in Coromandel must be your ultimate destination while you’re there! 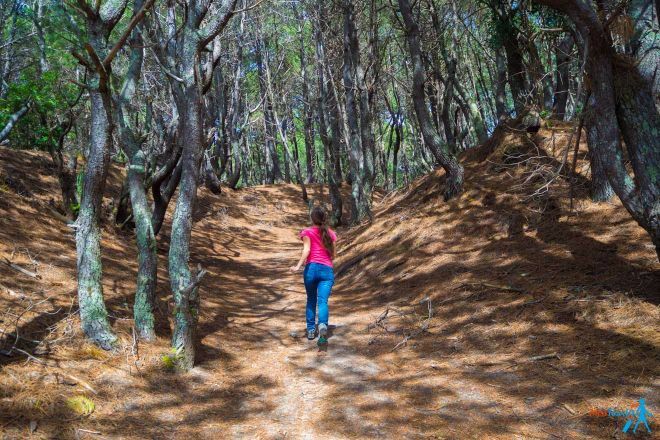 Also known as The Kauaeranga Kauri Trail, this hike will guarantee you some breathtaking views! The Pinnacles offer one of the best overnight walks in the entire New Zealand! If you don’t want to invest that much time and energy into it, then you should know that you can transform your visit to the Pinnacles in a day-walk. The complete trail can easily take you about 4 to 6 hours round trip if you’re in good shape. Here you can see the Pinnacles map and track overview. If you’re very short on time, you can also do the Billy Goat circuit which is much faster. Even though this can be done, I do not recommend it. Trust me, you want to do the entire track and then stay overnight (there is a Pinnacles hotel there) and see the sunset and sunrise – it will be the best reward in the world! If you don’t want to do this hike alone, then you can book a guided tour from Coromandel Adventures. It will take between 9 to 10 hours. The departure is from Coromandel Town at 6:30 AM and the return (if you want to return the same day) is at 5:30 PM. PRICE: If you decide on a tour, $75 NZD single and $140 NZD return for one adult. $50 NZD single and $112 NZD return for a child. You can find all the available tours here. I suggest you stay overnight at The Pinnacles Hut Coromandel, which is well maintained by the Department of Conservation. This is a serviced 80-bunk beds hut situated south of Thames, at a three-hour walk from the road end. You must book it online in advance! 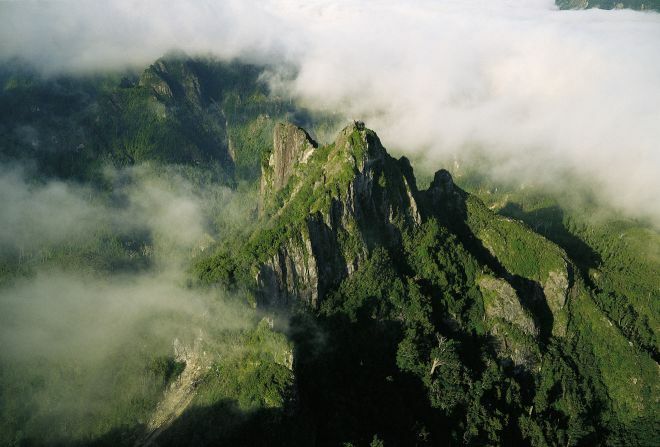 This is also a great Pinnacles camp ground, as it provides 4 tent sites for a maximum of 12 people. PRICE: $5 adult/night, $2.50 child/youth night (5 – 17 years). Check the updated prices here. If you ever get tired from all the walking around and hiking, I suggest you go to The Lost Spring in Coromandel! This incredible place will offer you a truly unique luxury thermal experience! If you go to The Lost Spring in Coromandel, you will find lots of hand-sculpted pools filled with where you can sit around in all day. 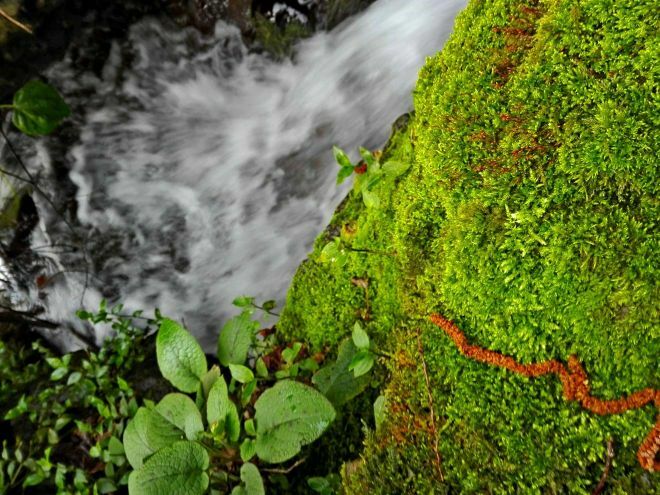 The source of this waters is a spring located 600 meters below the ground. You can also try lots of awesome treatments there that will improve your skin and mood. Their team of professional international therapists will be there to help you. My advice is to be prepared for a lot of relaxation and to free your mind of unwanted thoughts and maybe even treat yourself with some delicacies and good coffee! PRICE: from $60 NZD to $170 NZD depending on your desired package. Check all the available packages here. 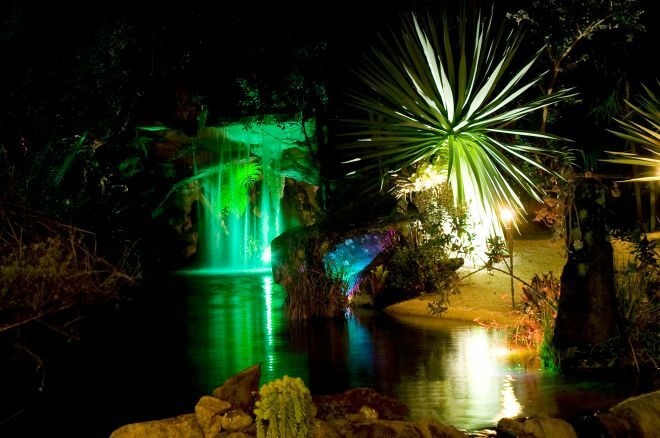 HOW TO GET THERE: The Lost Spring is in the heart of Whitianga. The complete address is 121a Cook Drive Whitianga 3510. If you want to find out about Coromandel’s gold mining history, then Karangaheke Gorge is the place to be! You will get to walk the paths of a very old railway in Coromandel and admire the beautiful scenery. You can even enjoy a good cup of coffee while you’re there – there’s one even in the original old railway station. If you want to be fancier, then make sure to sip a glass of wine from the winery. HOW TO GET THERE: Karangaheke Gorge is located on State Highway 2 between Paeroa and Waihi. You wouldn’t want to miss a cool train ride in Coromandel, right? 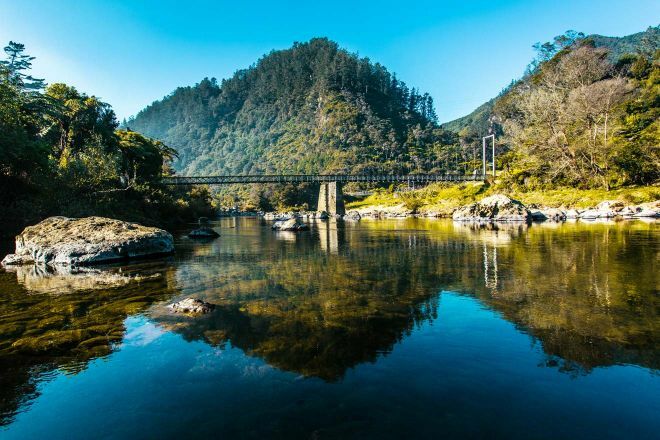 This train ride is one of the most popular Coromandel attractions and even a New Zealand must-do. This trip will take you on an amazing railway situated in the mountains. It will only take 1-hour round trip. The railway track goes up a mountain and then reaches a viewing platform (The Eyefull Tower) situated 165 m above Coromandel. You will get the chance to admire the amazing natural scenery and pottery sculptures that can be found along the track. The entire train ride includes 3 short tunnels, 2 spirals, 5 reversing points while climbing up to the Eyefull Tower. 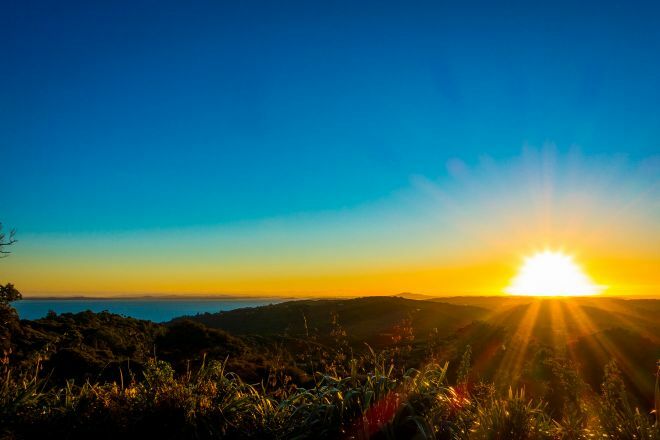 Once you get to the top, you will be rewarded with an incredible panoramic view of Hauraki Gulf. This awesome railway track was built by a man (Barry Brickell) who needed to bring clay and wood up to the top where he would use them for his pottery sculptures. Your driver will explain you more once you get to the top. If you’re interested, you can even buy some souvenirs and pottery sculptures to bring home – they will always remind you of this awesome activity you did in New Zealand and Coromandel! PRICES: $35 NZD for one adult, $13 NZD for one kid, $83 NZD for a family of 4. All prices are for the roundtrip ride. 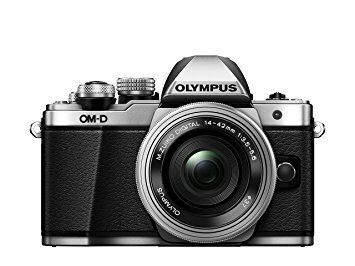 You can check the complete prices on their official website. If you don’t have a lot of time to explore The Coromandel, but you want to value every second of it, then I suggest you visit the area in style, with a Harley Davidson chauffeured passenger tour! 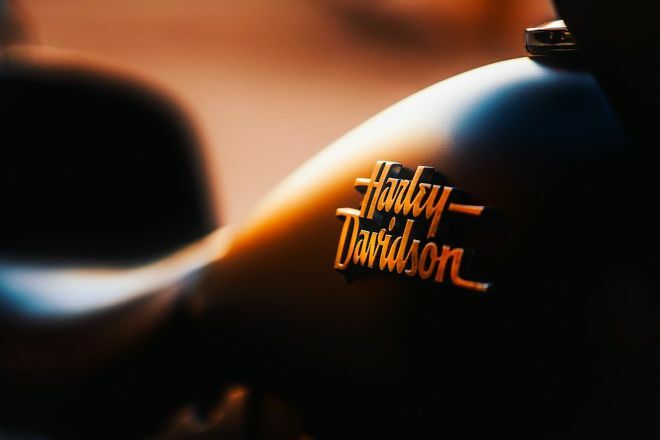 If you’re a sucker for adrenaline, what could be better than exploring The Coromandel roads and landmarks on a Harley Davidson? If you choose to have this unique adventure, you will start from Aukland and go see the spectacular Pacific Coast Highway around the Coromandel Peninsula, Hauraki Gulf, Coromandel Town, Kautounu, Whitianga, The Lost Springs, Coroglen Pub, Tairua, Thames and then you will be transported back from Coromandel to Auckland. 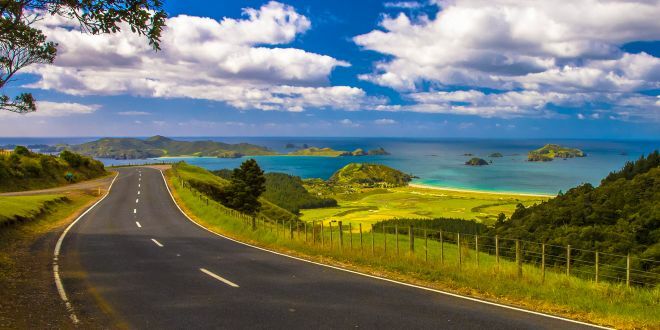 This tour is named Coromandel Loop Tour and it takes an entire day. Bularangi Morobikes have more Harley Davidson tours (even some self-ride ones) that you can check out on their website. NOTE: The tour can also be started from Tauranga, Thames or Waihi. Included: Helmet, jacket and gloves, lunch, entry to Lost Springs. 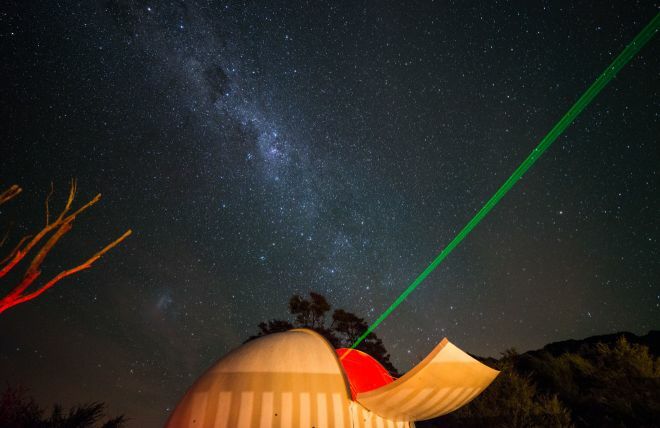 If you’re passionate about astronomy and everything else about it, then trust me – you don’t want to miss Whitianga’s Stargazers! Even if you’re not into this kind of stuff, this is the place to start falling in love with the world above us. Besides stars, you will also get to see planets and rocks and your guide will explain everything in detail. 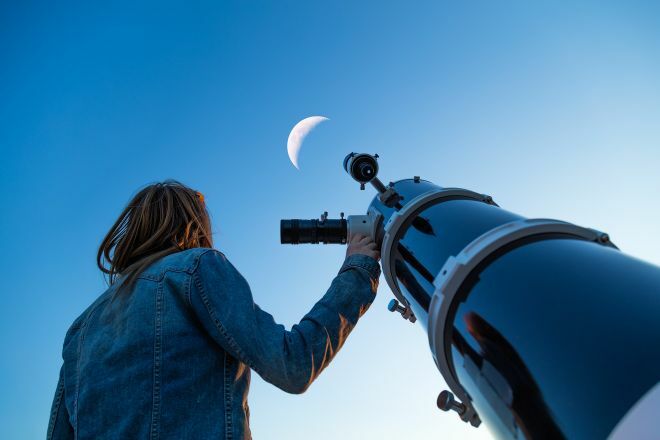 I especially recommend this activity for people from big cities where they don’t usually get the chance to see the stars clearly due to the light pollution. This place will transport you to another magical world, I promise! You will be most lucky if you will go there on a night with a clear sky. I’m sure you will fall in love with the moon and the stars there and you will discover a whole new world in Whitianga! If you want to spend some more time there, you can even stay overnight at their B&B, but make sure to book well in advance as the place is usually full! HOW TO GET THERE: The Stargazers can be found at 2 km South of Kuaotunu Beach and settlement. This place is a bit hidden away from the world, so it can be hard to find. That’s why I will leave here the complete directions from their website – they explain how to get there from Whitianga and from Coromandel Town too. Just make sure to search for their signs near the mailboxes when you arrive! If you’re curious to see two extraordinary Coromandel waterfalls, then this activity is for you! Walking this track on Wentworth Valley will take you over two bridged crossings, then you will have to climb to get to see the two waterfalls properly. The walking track is 3 km long and it will take you about 2 hours and 30 minutes round trip. HOW TO GET THERE: From Whangamata township drive south on SH25 for 2.5km. Turn right off the highway onto Wentworth Valley Road. The track starts at the road end. Now here is an activity that any bird lover will appreciate! Pukorokoro Miranda Shorebird Centre is situated an hour away from Aukland. I suggest going there if you want to escape the city and also to admire some incredible bird specimens, such as the wrybill – a seabird that can only be found in New Zealand! At Miranda Shorebird Centre the number of shorebirds exceeds 10.000! Go there to watch the birds and also hear some incredible stories about them from the people there! You will find shorebirds there all year round, but if you want to see as many as possible, I suggest you go there from January to March. The best time to view the birds is 2 hours either side of high tide. 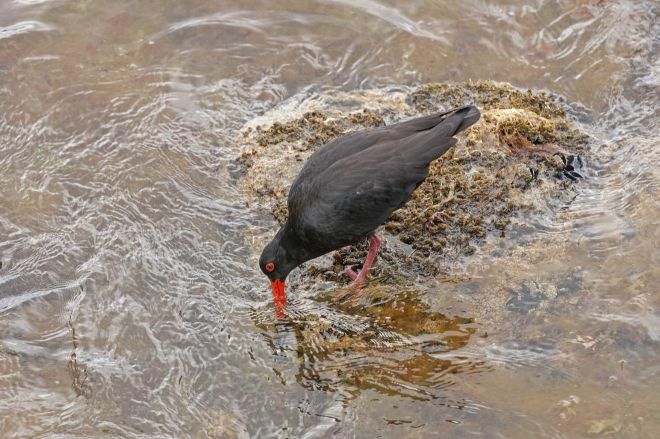 HOW TO GET THERE: The Shorebird Centre is located in Kaiaua (near Miranda). PRICE: They have free entrance, but if you want to stay overnight and also support them, you can do so at their Shorebird Centre Accommodation. If you don’t want to spend the night there, you can still help them by buying something from their shop or just make a donation! If you want to see a geyser in New Zealand, then why not visit the world’s only hot soda water geyser and some original Edwardian buildings and bathhouses? Make sure to add Te Aroha Domain to your to-do list for The Coromandel! This is a wonderful historic area and it was one of the most popular spas and health resorts in New Zealand at the end of the nineteenth century. 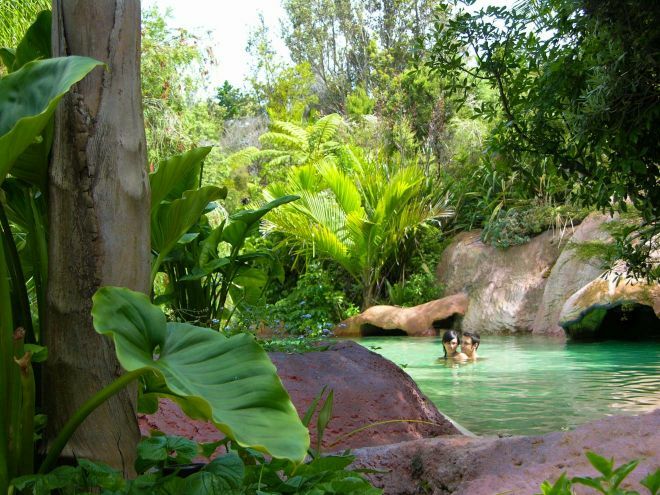 The Maori name Te Aroha actually means “Place of Love” so be prepared to fall in love with this attraction! You can have a nice walk there and admire the landscape, plant life and the vernacular buildings and get a taste of the Edwardian era. There are only a few original buildings left but their charm cannot compete with anything else! Of course, don’t forget to witness the Moneka Geyser – the world’s only hot soda water geyser! A must-see, for sure! HOW TO GET THERE: The main access to the reserve is from Whitaker Street with minor accessways from Church, Koromiko and Wilson Streets. New Chum is a protected beach where you won’t find any buildings, roads of camping places! This sounds incredible, right? 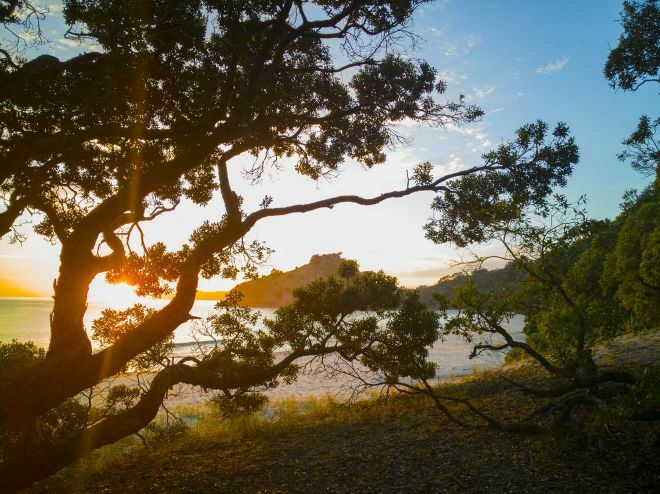 Go there to see the true, unaltered beauty of The Coromandel and I’m sure you won’t regret it! New Chum Beach was voted one of New Zealand’s 10 most beautiful beaches and it’s among the top 20 wilderness beaches in the world! HOW TO GET THERE: New Chum Beach is located in the Wainuiototo Bay, north of Whangapoua village. TIP: There are no toilets on this beach, as it is completely pristine, but you can find a public toilet in the carpark at Whangapoua Beach’s north end. IMPORTANT: When visiting New Chums, please stay on the track and the beach. 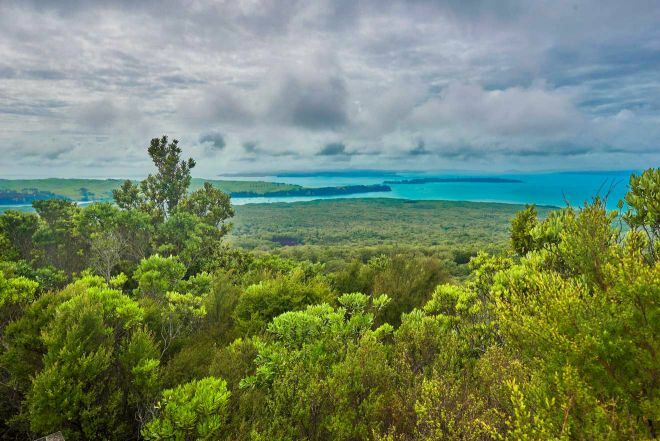 In the area beyond the beach and on the private land there is Kauri Dieback – a microscopic pathogen that infects the roots of kauri trees, making them die. The Kauri Dieback has no cure and it can be spread very easily by anyone because it stays on footwear and equipment, that’s why it’s not recommended to walk outside the special track. RELATED READ: Looking for some more wonderful beaches? Then you might be interested in Riviera Maya, Mexico! 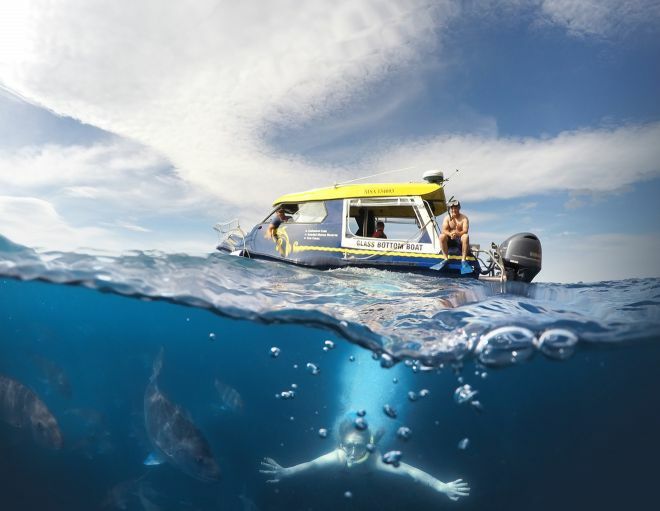 If you don’t have much time in the Coromandel but you still want to see all the highlights of its amazing marine life, then I strongly suggest you take a glass bottom boat tour. 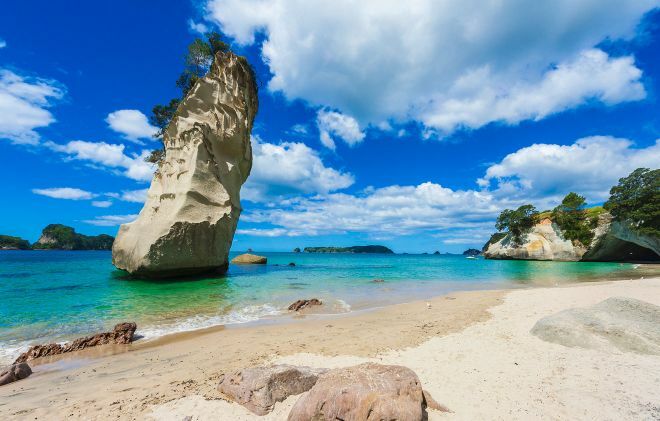 This one-of-a-kind tour will take you to Cathedral Cove, you will get to see the sea caves, the unique volcanic rock formations, the Pinnacles and even the marine reserve. You won’t be able to go off the boat at Cathedral Cove and walk, but you will enter the sea caves with the glass bottom boat, though. Te Whanganui-A-Hei is the only marine reserve in the Coromandel and it’s definitely a to-do if you’re passionate about this. 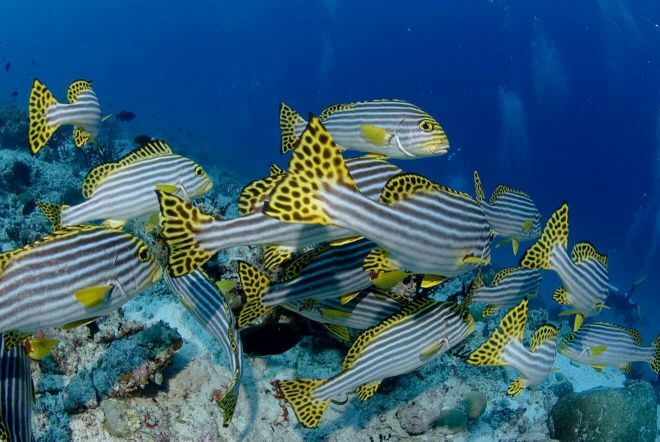 There are lots of amazing fish that you can see there such as blue cod, snapper, blue moamoa and more! If you get lucky, you can even catch a glimpse of some octopuses, crayfish or maybe even eels. One of the best parts of this tour is that they even have a mammal watch permit. This means you can even see some dolphins, whales and seals while you’re there! You can see the marine life through the boat’s glass bottom – just think of it as your personal aquarium! If you want, you can even get your equipment and snorkel. How cool is that? HOW TO GET THERE: This tour departs daily from the Whitianga Wharf. If you want, you can even organize your trip to depart from the Ferry Landing wharf. PRICE: $95 NZD for an adult, $60 NZD for a child and $280 NZD for a family (meaning 2 adults and 2 children). TIP: Because this is a very famous boat tour, I recommend you book well in advance to make sure you get some spots! Whenuakura Wildlife Sanctuary, also known as Donut Island is a magical place. You will find there a cool lagoon with beautiful turquoise water, surrounded by volcanic rocks. Donut Island is actually an old volcano and its crater is filled with water. Whenuakura Wildlife Sanctuary or Donut Island is one of the most beautiful coastal attractions in New Zealand! Once, this place was kept as a big secret, but now it has become one of the must do’s while in The Coromandel. While there, you can try some awesome tours that I’m sure you won’t regret. 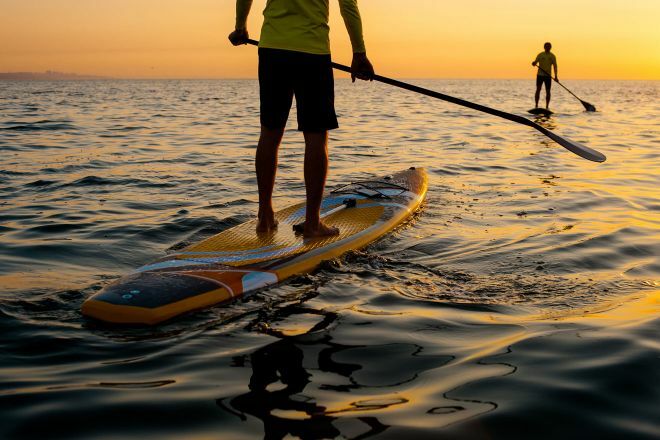 For example, you can try SUP – Stand Up Paddle Boarding. This is one of the fastest growing water sports in the world and if you haven’t tried it until now, then I suggest you do it in Coromandel! Another suggestion is to visit this amazing place with a kayak tour. This will be a great chance to admire the turquoise water, volcanic rocks and incredible fauna that this place keeps as a treasure! Plus, I’m sure you won’t ever forget your experience of kayaking in Coromandel! HOW TO GET THERE: Donut Island is situated only 600 m away from Whangamata. 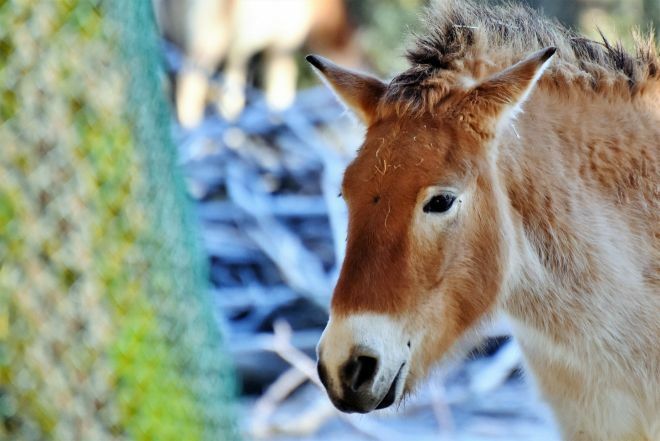 If you want to be surrounded by amazing birds and animals while in the Coromandel, you can stay and relax at Mill Creek Bird Park and Animal Encounters. This is one of the ideal places that you can visit together with your entire family and I’m sure all of you will have fun! 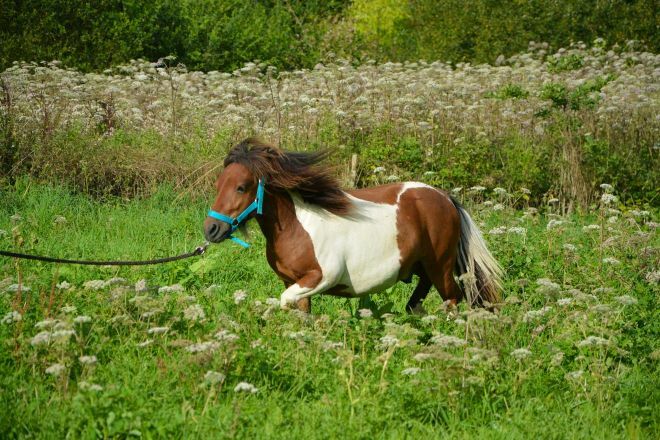 They have over 400 birds, mini horses, donkeys and other friendly animals you can feed and interact with! If you want to stay there for a longer time, you must know that they even have a campervan park and cabins or a self-contained unit. PRICE: Admission fee to the bird park is NZ$ 10 for an adult, NZ$ 3 for a kid and between NZ$ 1-2 for the food that you can feed the animals with. Prices for the campervan park is NZ$ 18 per adult/night and NZ$ 9 per child/night. If you would like to stay in a cabin it will be NZ$ 25 for an adult and NZ$ 10 for a kid. All the prices can be checked on the Mill Creek Birk Park website. If you want to go by car (which was my choice), then you should know that a drive from Auckland to Coromandel Town will take you about 2h30’. 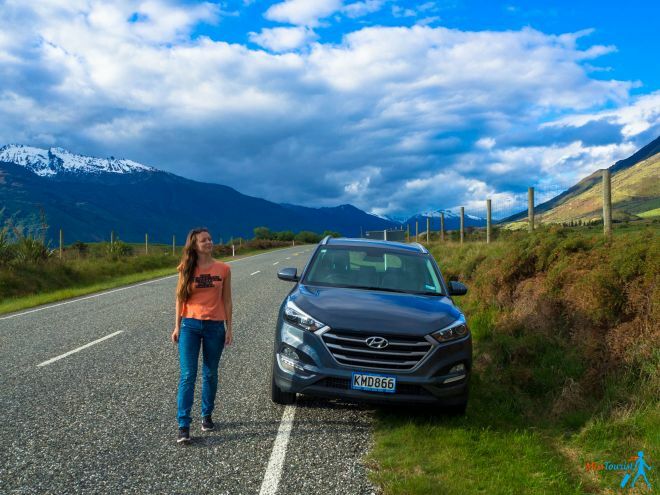 Here is my complete article where you can read about the 7 things you should know before renting a car in New Zealand. You can also choose to go from Auckland to Coromandel by bus. I recommend checking the InterCity website to find tickets and offers. The entire bus journey will take 4 hours, including a transfer at Thames, Coromandel. The InterCity buses depart from the Sky City Terminal on Hobson Street in Auckland and they arrive in Coromandel near the Information Centre accessed off Woollams Avenue. 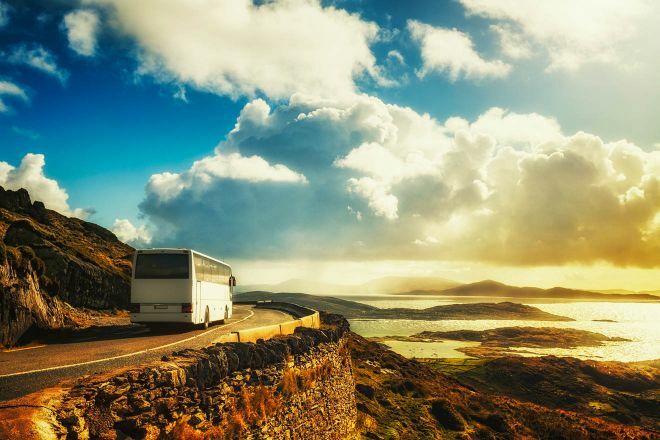 Price for the bus: around $40 NZD for Auckland – Coromandel one-way or $80 NZD roundtrip. Check the updated prices here. If you prefer to get to Coromandel by ferry instead, then you’re in for a 2-hour relaxing cruise. I recommend taking a ferry with 360 Discovery Cruises. Price: $60 NZD Auckland ferry to Coromandel one-way and $75 NZD roundtrip. Check the updated prices here. As I mentioned above, Coromandel is a special place that needs at least 3 days if you want to have enough time to walk around, surf, kayak, hike. I stayed in an awesome place called Marine Reserved Apartments which offers condos that are perfect for families or groups of friends. This is a great accommodation in Coromandel that I sincerely recommend! The best part? Marine Reserved Apartments is located only 100 meters away from Whangamata beach! One of the best facilities that this accommodation offers is the garage – very useful if you decide to rent a car for your New Zealand trip. Another advantage is that you can do your laundry there, which is great if you are spending a longer time in the country. Overall, the place has everything you will need to satisfy your needs. It has a large living room as big as the entire last floor where you can lounge. 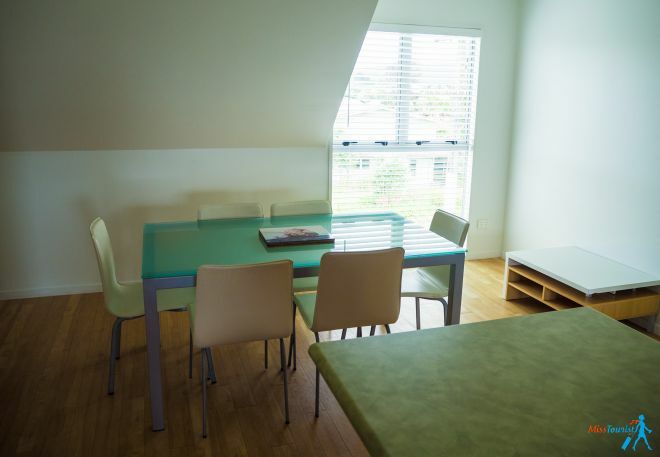 Each apartment has its own kitchen that’s well equipped with everything you may need. You will even get your own balcony with a BBQ! What more could you need? If you need to fit more than 2 people, I recommend the 2-Bedroom apartment that has 1 queen bed and 2 single beds. Luxury ($180 NZD and up): If you want to spend your Coromandel vacation in style, then you should take a look at Pinnacle Views NZ. This luxury accommodation is located 42 km from Coromandel Town and it’s a perfect retreat spot for 2 people. My second suggestion is Paku Palms – also the perfect accommodation in Coromandel for 2 people that want to be only 15 minutes away from the beach. 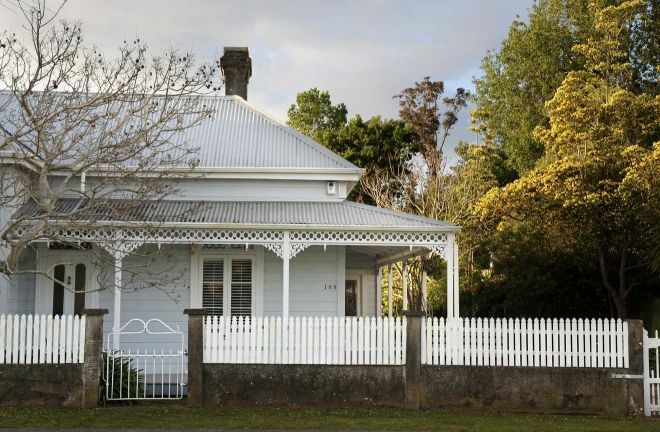 Middle ($120-180 NZD): For a middle-priced hotel in Coromandel, check out Grafton Cottage & Chalets. You can stay in private chalets and they have an outdoor swimming pool and a great sea view. Pipi Dune Bed & Breakfast is a very clean and sunny place, situated only 4 minutes away from the beach. 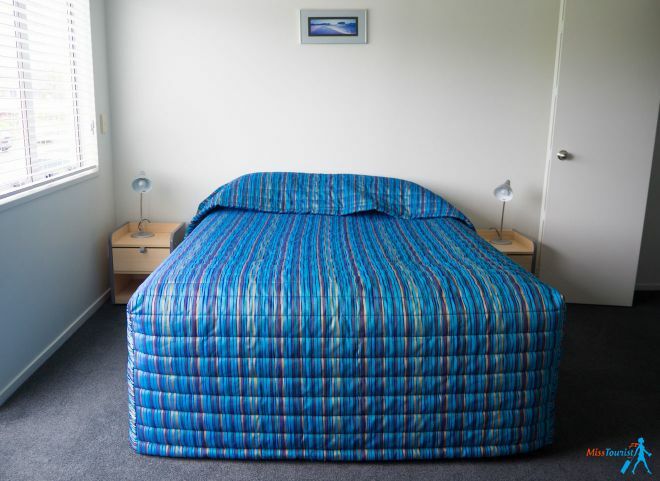 Budget (up to $61 NZD): A great budget hostel in Coromandel is Peebles Cottage. The accommodation is situated in Kuaotunu and they have free Wi-Fi, barbecues and a great garden. Another very good and cheap accommodation in Coromandel is Little Paradise Lodge, in Whitianga, on the east coast of the Peninsula. They even offer free on-site parking, which is great. If you’re on a tight budget or you feel more adventurous, then you can choose camping as a good accommodation alternative. 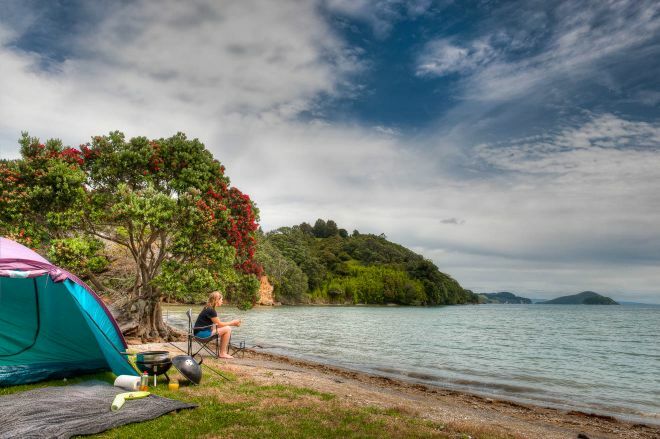 There are many specially organized campgrounds for both tents and campervans around New Zealand, including in Coromandel. Here you can find a list of all the holiday parks and camping sites in Coromandel, including their websites and prices. The price is different from camping to camping, but it is somewhere around $10 to 40 NZD per tent site or around $50 NZD or more per campervan. As I previously said, I did not camp while in New Zealand, but I learned a lot about it while traveling there. You can find more information about camping in New Zealand in my How to plan your ideal trip to New Zealand article where I explain everything you must know. A Day-By-Day Guide to Help You Book All Accommodation for Your New Zealand Trip! Coromandel is an amazing place and I recommend staying there for at least 3 days in order to have some time to explore and enjoy the beauty of the peninsula. Here I described the best 15 things to do in the Coromandel. I hope you added some things to your bucket list and you will visit this unique place in New Zealand! 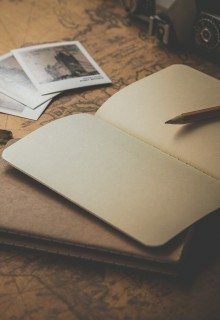 What is your favorite place or activity from this list? Let me know in the comments – I love to hear your opinions and questions! If you found this article interesting, you can share it with your friends! I was here and tried to dig the sand for the hot water but was not lucky enough to bath on it haha. But I really love the cathedrals cove, they’re stunning! it is probably not that easy huh? Great to here i am deciding to visit New Zealand next month and i’m collecting information about the country! This is a wonderful travel article.I love how you concentrated on a specific part of the country instead of the entire New Zealand. Well done. Very useful information. 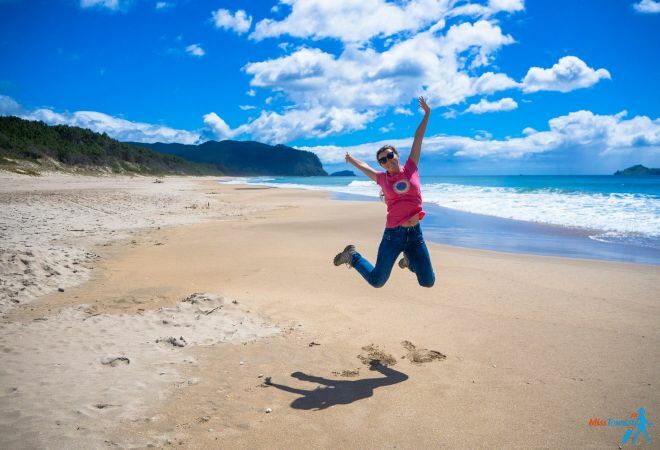 Thanks so much for the great post, we can’t wait to go to Coromandel! Fantastic suggestions, helped me a lot to plan our soon to happen trip to New Zealand, both islands. I find your blog extremely useful.I will be going to NZ in a week and found lots of info on most everything. Brava!